The last group of evaders that the Pat Line took to safety included two Americans. This is fortunate for me because today we have access to some of their very personal and extensive reports that include the kind of detail that most British reports lack. The dates in the reports don't necessarily agree (hardly surprising under the circumstances) but we are able to get a pretty good picture of events. At the end of March 1943, the Pat Line guided their final three evaders across the Pyrenees to Spain. They were Sgt Robert M Kidd RNZAF (1207) 2/Lt Grady W Roper (#27) and T/Sgt Miles Benton Jones (#29). Another American, T/Sgt Arthur B Cox Jnr (#47) accompanied the last survivors of the line out of France the following month but their journey should really be credited to Francoise Dissard. The beginning of the end of the Pat Line starts a little earlier though so I will include other evaders and characters to try and give some background to this tragic story. On 8 November 1942, the Allies launched Operation Torch, the Allied invasion of North Africa. Three days later the Germans took over the southern area of France that had previously been known as the non-occupied zone (ZNO). This made further operations from the Mediterranean beaches (a Pat Line speciality) impossible and meant that all evaders would have to take the more arduous routes across the Pyrenees to Spain. It also meant that the Pat Line personnel were at far greater risk of arrest and deportation to Germany. As a direct result, Louis Nouveau, who was much too well known in Marseille, moved to Paris from where he and Alex Watteblad continued in their efforts to expand the Pat Line into Brittany by joining forces with an organisation at Pontivy. Unfortunately, this expansion led to the biggest error of Nouveau's operational life when in January 1943, he recruited a new courier into the organisation. Roger Leneveu (aka le Legionnaire) came to him with excellent credentials and had genuinely been part of the early resistance movement. What no-one in the organisation knew was that Roger had been turned by the Germans and now worked directly for the Gestapo. The organisation was still recovering from the betrayal by their English courier Harold Cole in November 1941 but this attack from a professional infiltration agent would have far more serious consequences. With Nouveau in Paris with Jean de la Olla, and Robert Leçuyras (aka Albert) and nineteen year old, Italian-born Fabien de Cortes taking over operations in Marseille, Pat O'Leary moved his centre of operations to Toulouse in November 1942. He already had several contacts there, including Paul Ulmann and Francoise Dissard, and Stanislas and Augustine Mongelard of the Hotel de Paris, which had been used as a regular safe house from at least February 1942. Other significant events around this time included the release of PAO radio-operator Alex Nitelet and several SOE agents from Chambaran in November, the rescue of Ian Garrow from prison at Mauzac in December and his subsequent escape to Spain, and the assisted prison break of ten men (including Gaston Negre and radio-operator Philippe Valat) from Castres in February 1943. In addition to the ever increasing flow of evading airmen, there was also the arrival of the two surviving RM Commandos from the Operation Frankton raid on Bordeaux harbour in December. They had been picked up by the still recovering Mary Lindell who, unable to re-establish her routes across the Pyrenees, had passed them on to John Carter in Lyon. Carter arranged for them to be sheltered in Lyon until Fabien de Cortes brought them to Pat in Marseille. Sgt Arthur B Cox Jnr was top turret gunner of the B-24 41-23678 Ball of Fire which was shot down 9 October 1942. Cox landed near Douai (Pas-de-Calais) and was sheltered locally until contact was made with an organisation. On 30 January 1943, Cox was moved to Mme Weise in Lille where he met Maurice Wilson. F/O Maurice H G Wilson was flying 4 Sqn Mustang AG545 on a photo recon mission on 18 January 1943 when he was shot down over the Somme. After being sheltered overnight by Alfred Gaville at Vironchaux, he was taken to Frevent where he was helped by the Bordeaux-Loupiac organisation and sheltered for a week with dentist Raymond Hetroy and his wife. On 3 February, Roger Leneveu and Frederick Doublemetre took Cox and Wilson to Paris where they stayed overnight in an apartment near the Arc de Triomphe before moving to another with its view of Notre Dame. On 6 February, Leneveu and Doublemetre took Kidd, Jones, Cox and Wilson along the regular PAO route first established by Roland Lepers in 1941. They took a train to Tours where they changed for St Martin-le-Beau (Kidd says near Blere) then crossed the river (and demarcation line) to Loches. They were collected by lorry and driven to Chateauroux where they stayed the night before continuing to Toulouse next morning. They went first to the Hotel de Paris on rue Gambetta and then straight on to Paul Ulmann's home where they met Grady Roper and Jack Dawson and stayed until 19 February. On his return to Paris, Leneveu delivered a letter to Louis Nouveau from Pat O'Leary asking him to come to Toulouse. On 12 February, Nouveau left Paris with Suzy Gerard (wife of passeur René Gerard at Loches) and Doublemetre and five evading US airmen from the B-17 42-24584 SUSFU. They were changing trains at Tours when they were arrested by German police who addressed Nouveau by his operational name of Saint Jean. Later questions from the Gestapo convinced Nouveau that it was Leneveu who had betrayed them. 2/Lt Grady Roper (#27) was the navigator of B-17 41-9018 which was shot down near Saint-Amand (Pas-de-Calais) on 9 October 1942. He was sheltered at Saint-Amand for two and a half months before his helpers managed to make contact with an organisation. At the end of December, Jean de la Olla took him to Paris where he met Louis Nouveau who passed him on to Amand Leveque at 19 Avenue d'Orleans. M Leveque arranged Roper's accomodation in Paris until 9 January when Jean de la Olla took him by train to Dijon. At Dijon station, Roper joined a well dressed group of fellow evaders, 2/Lt John Trost (#28) W/Cdr John Embling (1108) Sgt Cyril Penna (1190) Sgt Jack Dawson (1160) and F/O Prince Werner de Merode (1131) with their guide Jean Bregi (aka Philippe). Also with the group were new recruits Roger Leneveu and Frederick Doublemetre (both along to learn from Jean Bregi) a Belgian guide named Latory and his son Louis. They took a bus to Chalons, where Latory got them across the demarcation line, and then a train to Lyon and finally an overnight train to Toulouse. In Toulouse, the evaders and Jean Bregi stayed with Paul and Imelda Ulmann whilst the others were housed at the Hotel de Paris. Next day, de Merode and Embling left for Bergerac and the day after that Pat O'Leary arrived with new ID cards for the evaders. Then Alex Nitelet arrived with the news that PAO radio-operator Tom Groome, his courier Eddie and the Cheramys had been arrested (11 January) at Montauban. Fearing the worst, Jean Bregi took the remaining four airmen to Marseille where they were met by Fabien de Cortes and Robert Leçuyras (Albert) and lodged with Mme Therese (Maud Olga Andrée Baudot de Rouville aka Therese Martin) in her apartment on Boulevard Cassini. According to Fred Boulle's 1946 interview with Francoise Dissard, both the Hotel de Paris and the villa on rue Pierre Casaneuve that Paul Ulmann had rented to house evaders were abandoned at this point and O'Leary moved his headquarters to Francoise Dissard's home in rue Paul Meriel. At the end of of the month, O'Leary moved to an apartment that Francoise had rented for him, the address on nearby rue des Puits Clos known only (supposedly) by Francoise and Renée Nouveau. On 22 January, Fabien de Cortes took Grady Roper to Nice. Paul Ulmann with his wife and sister met them at the station and took them to stay with forty-four year old René Sainson and his wife Lucie at 7 rue Barralis where Roper joined T/Sgt Erwin D Wissenback (#11) 2/Lt William J Gise (#15) and Capt Richard D Adams (#26). Next day, Fabien took Wissenback and Gise to Marseille and the first part of their journey to Spain while Roper and Adams (soon joined by Dawson and Penna) stayed on in Nice, well fed by Lucie and her excellent black market contacts. A few days later Fabien and Albert (Leçuyras) collected the four airmen and took them back to Marseille and then straight on to Toulouse where they were met by Guy Berthet. Leçuyras returned to Marseille while Guy and Fabien took the evaders on to Bergerac where Roper and Adams stayed with Maurice Loupiac. Bernard soon took Adams back to Toulouse where he joined Trost, Embling, Penna and Louis Letory. Then Guy Berthet arrived in Bergerac to take Roper, Dawson and Penna to Toulouse, collecting Bernard Gohon as their guide along the way and joining the Trost group at Toulouse station. Unfortunately Roper and Dawson became ill on the crossing from Ussat-les-Bains to Andorra (the weather was truly appalling) and Werner de Merode brought the pair back to Paul Ulmann's house (see note and comment above) in Toulouse where they met Robert Kidd, Miles Jones, Arthur Cox and Maurice Wilson. De Merode left next day for Marseille. Over next two days a group of men who had escaped from prison at Castres arrived, including BCRA radio-operator Philippe Valat, Gaston Negre, Pierre Lanvers, a Canadian airman and an American sergeant. Valat had taken over after Roger Gaston was arrested September 1942, himself a replacement for Alex Nitelet, arrested in August. About a week after that, O'Leary decided to try and take Jones, Cox, Kidd and Wilson, along with Philippe Valat and Nancy Fiocca (née Wake) plus the escapers from Castres, across the mountains. On 19 February, O'Leary, Guy Berthet and Bernard Gohon took them as far as Banyuls-sur-Mer but they were seen jumping from the train and scattered. Some were caught, including the Canadian airman, the American sergeant and Guy Berthet. O'Leary contacted Paul Ulmann in Toulouse with the news of Guy's arrest and Paul quickly moved Roper and Dawson to another address for two nights until Bernard arrived to take them back to Marseille. The evaders were taken to Mme Martin in the Endoume quarter where they were reunited with Werner de Merode. They also met Danielle (Eddie) Reddé and the two Royal Marine Commandos, Major Herbert Hasler (1140) and Marine William Sparks (1162). Eddie had escaped from Gestapo headquarters in Toulouse in the confusion following Tom Groome's thwarted escape attempt when he threw himself out of a window. Next day they were joined by Jones, Cox, Kidd, Wilson and Nancy Fiocca. Jones, Cox, Kidd and Wilson had stayed together after the debacle at Banyuls and hid in the mountains for three days with Pat O'Leary, Nancy and Philippe before walking to St Elme to get a train to Perpignan. They stayed three nights with Solange Lebreton (Chouquette) at the Hotel du Tennis at Canet Plage before returning to Marseille. They were met by Fabien and Bernard who took them to Mme Therese on Blvd Cassini, then to Mme Martin where they met Eddie and the two British Commandos. The following day, they were taken to René Sainson in Nice. Next day, Pat O'Leary arrived at the Martin home with the news that he had arranged passage for Hasler, Sparks, Werner de Merode and Jack Dawson. On 1 March, the four men were taken across the Pyrenees from Ceret to Banolas and delivered safely to the British Consulate in Barcelona courtesy of the Ponzan-Vidal organisation. On 2 March, Pat O'Leary and Paul Ulmann were arrested at the Super Bar café in Toulouse, lured there for a meeting with Roger Leneveu. On the night of 1 March, Patrick returned from Marseille at three o'clock in the morning, he had come to rest, eat and to hear the latest news. I brought him up to date with events. At about five in the morning, I told him to go and sleep in his apartment at rue des Puits Clos while Mme Nouveau, Nancy Fiocca and three airmen stayed the night with me. I did not have any more beds. I told Patrick to rest until eleven o'clock and that I would see to the guides and arrange the meetings. I would send them to him at eleven-thirty when he had rested. At about nine o'clock on the morning of 2 March, Paul Ulmann came around and I told him that I was arranging the appointments for Patrick. He asked me to tell Patrick 1) that he had a meeting with the guides from Perpignan at midday with the Café de la Paix 2) that he had a meeting with Roger le legionnaire at half-past twelve at the Super-Bar and 3) that he had a meeting at three o'clock with 'Geo from Loches' at the Café Glacier. I told Paul Ulmann that Patrick would be resting until eleven-thirty and that I would tell him then. Paul said that he would take Patrick (to the meetings). At eleven-thirty I told Patrick about the appointments and he said: "That's perfect, I will come back at one-thirty to take Mme Nouveau and Bernard to lunch with me, you have enough to do with all those (evaders) who cannot leave." And he left with Paul. Towards five o'clock, Patrick not having returned, I started to become concerned and I sent Bernard on the bicycle left by Paul Ulmann. I told him to go first to the Café Glacier then to the Super Bar and if necessary to the Café de la Paix to look for Patrick. Half an hour later, Bernard returned saying; "I did not see Patrick at the Glacier so I went to the Super Bar. I asked the patron if there had been raid, he told me that three men came in at about one o'clock to take an aperitif and that immediately the Police had arrested them." Meanwhile Melda (sic) Ulmann had telephoned to say that her husband had not returned from lunch, and we had no more doubts; Patrick, Paul and Roger le legionnaire had been arrested at the Super Bar. It was only later that we knew the role played by Roger le legionnaire. On hearing the news of O'Leary's arrest, Francoise immediately sent Nancy to stay with the Cros Duteuil family in rue d'Espagne. That night, Robert Leçuyras arrived from Marseille and having checked and found that Patrick's apartment and Paul's house had been searched, he ordered Francoise to leave her house and take Mme Nouveau and the three airmen with her. They left at three in the morning for Bergerac. Leçuyras returned to Marseille and the Martin home with news of the arrests. He sent Eddie and Grady Roper to the Rodocanachi apartment in the rue Roux de Brignolles but George's wife Fanny warned them the Germans had been there that morning so they returned to the Mme Martin. Fabien then took Roper to Lucie Sainson in Nice where he was reunited with Jones, Cox, Kidd and Wilson. A few days later Fabien came back with Nancy Fiocca and Tony Friend (Anthony Gabe Friend was an Australian-born Monaco policeman who had worked with the PAO since the previous year) who told them they would all need new 1943 ID cards – which they acquired with help from Nancy. Fabien then took Arthur Cox and Maurice Wilson to Grenoble. NB. Dr Georges Rodocanachi was arrested 26 February 1943 but it's not thought that this was connected to his involvement with the Pat Line. He was deported to Germany and died at Buchenwald in February 1944. A few days later Bernard Gohon arrived in Bergerac to tell Francoise that everyone in the Paris organisation had been arrested : Louis Nouveau, Jean de la Olla, Jacques Watteblad, Sebastien (Jean Bach from Brittany) etc. The disasters had continued in Marseille with the Martin family, M & Mme Henri Digeon and Alex Benzi of the Petit Poucet being arrested, and Fabien de Cortes being picked up in Lyons. Bernard then went to Nice to pass on the bad news and René Sainson immediately had the evaders moved to a neighbour's house, with Lucie supplying their food. Bernard soon left again for Perpignan where he arranged guides to Spain for the remaining evaders while Francoise and Renée Nouveau went to stay with the Fenelon family in Cahors. On 22 March, Nancy Fiocca took Kidd, Roper and Jones to Perpignan. They were met by Bernard who took them to the home of Spanish guide where they found Eddie Reddé, Renée Nouveau and three French escapers from Castres. On the morning of 30 March, they and their Spanish guides (one called Juan - assume Salvador Aguardo) were loaded onto trucks and driven into the mountains north of Ceret. That night the whole party were taken across the Pyrenees to Spain. 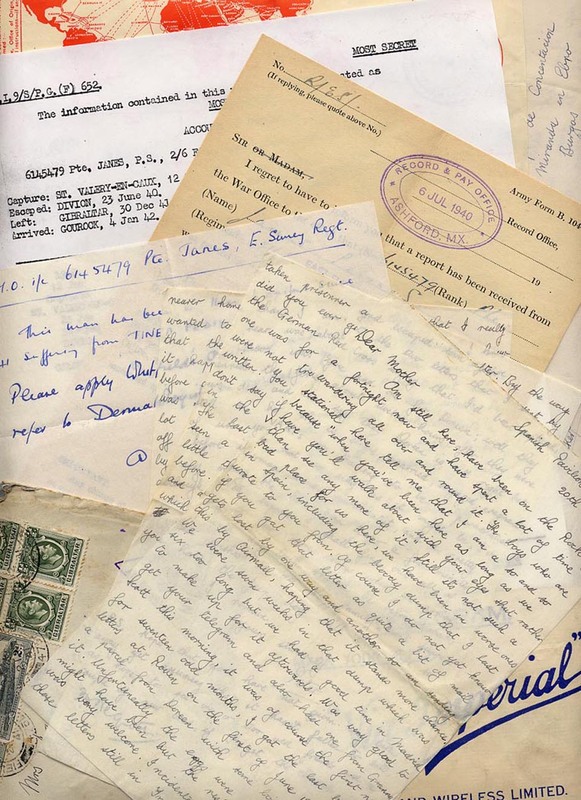 Of the evaders in this story, that just left Sgt Arthur Cox USAAF and F/O Maurice Wilson RAF in Grenoble and fortunately we have Cox MIS-X report to fill in some of the details. Cox and Wilson were sheltered in Grenoble by a Yves & Germaine Jean at 44 bis rue de Stalingrad until 10 April. The family soon became nervous of keeping them and anyway, they weren't receiving the promised funding from the organisation. The two evaders were on the point of leaving by themselves when Edmond Coté arrived and moved them to stay with Mme Papeduka-Vial at 20 rue Docteur Marez, opposite the Italian Café. Three days later Edmond took them to Grenoble station where they met Antoine (Pierre Ryckebusch - alias Antoine Vautier) who took them to Toulouse where they were lodged with M & Mme Lacombre at 108 Chemin de Nicol. On 25 April, Robert Leçuyras and Francoise took Cox to Narbonne, where he met Georges Zarifi (nephew of Georges and Fanny Rodocanachi) and on to Perpignan. Cox and Georges stayed four nights at Perpignan before being taken to a garage and loaded onto a truck with Leçuyras, Edmond Coté, Peter Bordeaux and an un-named Belgian. They were driven south to the now forbidden zone interdit where they waded across the river Tech. Their Spanish guides took them over the mountains to Spain the night of 27/28 April 1943. On 28 April, Pat O'Leary and Fabien de Cortes (and other prisoners from the Pat Line) were taken from St Pierre prison in Marseille to Fresnes on the outskirts of Paris. As their train pulled into the station at Paris, Fabien escaped through a window and went to Geneva to report to his former SIS boss Victor Farrel. After arriving there 20 May and making his report, Fabien returned to France the following month to try and get to England. Details are scarce but it was Francoise Dissard who arranged for Fabien to join Maurice Wilson and Pierre Ryckebusch on their escape attempt to Spain in June 1943. The party were arrested near the border at le Boulou – believed to have been betrayed by their guide who was himself arrested a few days later. All three men were sent to Fresnes - where they joined Pat O'Leary. René Pierre Sainson was arrested in November 1943 and sent to Mauthausen concentration camp in April 1944. He died at a work camp at Melk in Austria on 23 December 1944. Today, a plaque on his home in rue Barralis and a few blocks west, the rue René Sainson, are dedicated to his memory. Following her husband's arrest, Mme Lucie Sainson went to Brittany where she continued helping evaders until the Liberation. Although most of the story is available from public sources, my particular thanks to Michael Moores LeBlanc in Canada, Edouard Reniére in Belgium, and Oliver Clutton-Brock and Robert Lyman in England, for bringing some of the finer details to my attention. Thanks also to Fiona Wilson and Marie-Claude Ryckebusch for information not found elsewhere. When I first posted this article, I wasn't able to identify Francoise Dissard's right-hand man Bernard. In February 2016, Jean Michel Dozier emailed from France to suggest (and later confirm) that Bernard was Bernard Gohon (recommended by IS9 for a KMS) .